College is a time for experience and exploration, figuring out what you want, or don’t want, to do for the rest of your life. These learning opportunities are invaluable, as 2017 alum Hannah Adams learned first-hand. 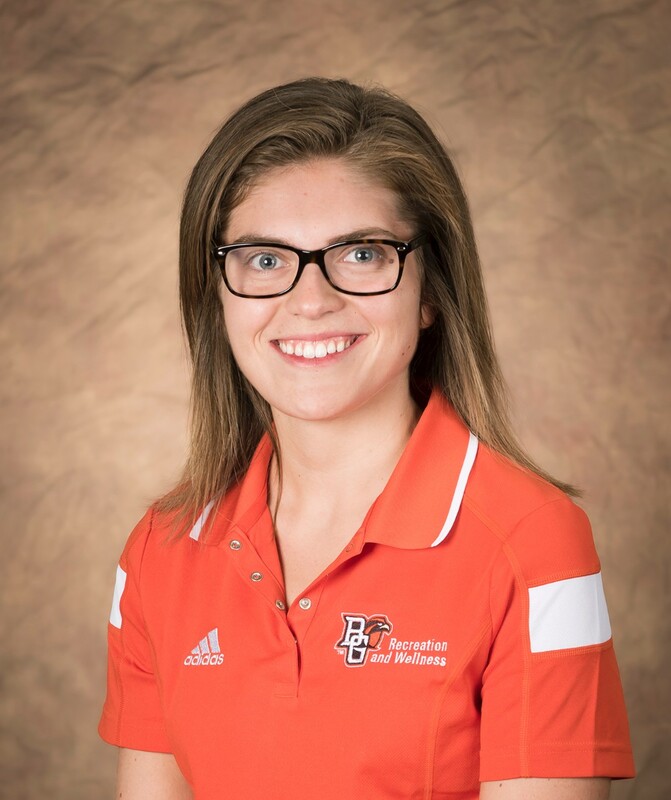 She came to BGSU a marketing major, but after joining a business fraternity on campus and working in customer service, she was able to blaze a new path toward her professional goals. As a member of a business-centric organization, Hannah was surrounded by people who were passionate about business – which made her realize she was not. She was very interested in the administration side of business, however, and enjoys working with older adults, so she switched to a major in Gerontology, intending to be a healthcare administrator. Around the time of transitioning into a new major, Hannah began working at the Student Recreation Center. She wanted a job on campus, and a friend recommended applying to the Rec. In her time with RecWell, Hannah has seen major changes; when she started as a Customer Service Attendant, the Rec was still under renovation, and her shifts took place on the basketball court! She has since received a promotion, becoming a Customer Service Associate. Navigating college can be a daunting task, especially for first-generation students; finding employment, joining organizations, and figuring out post-grad plans require time, energy, and resources, but alum Sara Scacchi (’17) was up for the challenge. During her first year at BGSU, Sara joined Delta Sigma Pi, the professional business fraternity on campus, and was a finalist in The Hatch, an annual campus-wide competition where 12 students pitch business plans to a panel of investors in front of a live audience and thousands of online viewers. 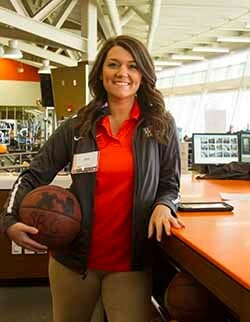 These involvements shaped Sara’s BGSU experience, helping plan her future and join the department of Recreation and Wellness. Working as a Customer Service Associate (CSA) has aligned handsomely with Sara’s skills and aspirations; she is going into sales, so her day-to-day duties are directly related to her post-grad work. She feels prepared for the future because being a CSA included frequent face-to-face customer interactions, product and service offering explanations, and problem-solving. She has come to understand the value of a learning curve. It reassures me. It has definitely prepared me for the next step in my life. It’s been nice having the right stepping stone to get there. Sara is beginning her professional career as a sales representative at a Professional Employer Organization in Richfield, Ohio, called Group Management Services; there, Sara will help out small businesses, meet face-to-face with clients, and problem-solve just like she did at the Rec. She is toying with the idea of being a professor someday, and is very thankful for her experiences at BGSU. “This job has been really, really rewarding because you get to see yourself progress. I remember my first shift. I didn’t know nearly anything about the Student Rec Center…and now I’m the one that’s teaching and helping the new people. As I look back on my assistantship, I wonder what Leah without RecWell will be like. Will she still live off post-it notes? Will her future students reply to her emails? Will she continue to add “#blessed” to almost everything? Jokes aside, working here has been a memorable, developmental, and rewarding experience for me. Our student staff has been nothing short of remarkable. In addition to countless splendid interactions I have with student attendants, associates, and managers in Marketing, Outdoor Program, IMs and Sport Clubs, PFH, Golf, Wellness Connection, SRC Facilities, SRC Welcome Desk, and Aquatics, I’ve had the distinct honor of advising the Student Employee Board, working alongside not one, not two, but twelve student supervisors across the department! These fabulous humans each bring their own form of leadership to their roles, staying true to their convictions while complying with department policies. I have been immensely fortunate to work with such a diverse group of skills, interests, and aspirations, and I want every member of SEB to know how proud I have been to serve as their advisor. Similarly, I have greatly enjoyed working with RecWell’s professional staff. I did not come to BGSU expecting to be treated with the respect and authority of a peer by senior staff, but I have been made to feel competent and qualified here. Working alongside these professionals has shaped the image of the practitioner I hope to become. Thank you, Thad and Susan, for always being bubbles of positivity and support. Thank you, Gary, for making me feel like each and every Friday email I sent was valued. Thank you, Lona, for showing me “less is more” (plus a bunch about ice, ice rinks, and ice skating) and for being a mentor, a teacher, and a friend. Of course, I cannot reflect upon my enriching experience without mentioning the other graduate assistants in RecWell. If this department is a family, the GAs are siblings. The opportunity to learn, grow, and develop alongside other graduate students has been invaluable to not only my education but also the success of this department; separate, we have impressive specializations, but together, we are synergistic superstars trouncing ThunderCats, Power Rangers, and Captain Planet. My fellow GAs have done so much for me, and I would do anything for them. I have a genuine appreciation for, enjoyment in, and devotion to this department. My experience as Student Programming and Leadership GA has included program coordination and facilitation, assessment, public speaking, collaboration, advising, committee participation and leadership, app implementation, incentive program management, and parade float design, construction, and operation. I cannot express just how #blessed I feel to have been a part of RecWell! By dedicating full-time staff resources, Recreation and Wellness launched the Student Development and Leadership Program (SDL) in 2007, which offered students additional leadership training. Through the development of the SDL program, BGSU Recreation and Wellness became an early innovator within the National Intramural and Recreational Sports Association (NIRSA), the governing body of collegiate recreational sport. Lona Leck, assistant director of marketing and student employment explained that “the purpose of these events is to provide students with something greater than just the basic work experience. These events help educate students on different topics, to help make them more well-rounded in the workplace, as well as in their daily lives.” Participation contributes to the acquisition of a BGSU Leadership Certificate for qualified and enrolled students. The Student Development and Leadership program provides training that includes a philosophical orientation of the field of leadership through a series of workshops. SDL workshops offer hands-on educational experience and prepare individuals for lifelong career development and personal growth. Participants develop an appreciation for engaged leadership while inspiring active and healthy lifestyles. In order to promote student learning, all SDL sessions are grounded in theory. The anchors for theoretical support are Kouzes and Posner’s Five Practices of Exemplary Leadership, BGSU Pillars for Student Success, and BGSU’s Core Values. Facilitators are mindful of these connections when creating programs. Each year the programs are geared to meet Student Affairs Learning Outcomes as well as adhere to the core values set forth by the University. The programs cover a variety of topics including: an annual session on diversity, customer service/conflict management, interviewing skills, resume development, hot button topics, and student interests. For more information on the History of Recreation and Wellness, visit our website. 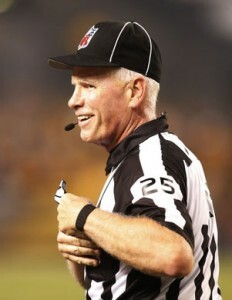 NFL Official of 19 years, Bob Waggoner shares his experience officiating Superbowls XL and XLIX, explaining the dynamics of the third team on the field.